Rendering of mural in Çatalhöyük that some say shows nearby mountains and a kind of map of the community. Adapted from Image by: Schmitt AK et al. Source: Sci-News.com. 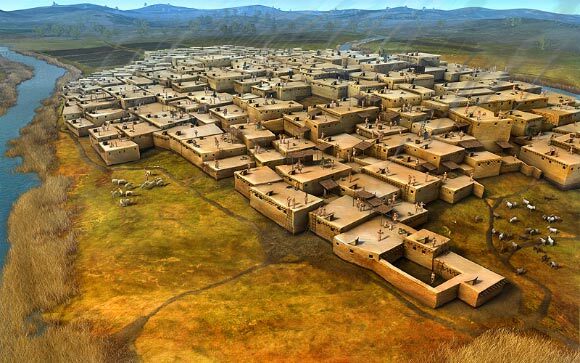 Artist’s impression of Çatalhöyük. Image credit: Dan Lewandowski. Source: Sci-News.com. In any event, here was a city that, strangely enough, seems to have been laid out along lines similar to what I’d once imagined from Abe’s line about “the narrow crack dividing house from house.” Çatalhöyük’s particular organization of habitat (bunched together so that one entered each one from above) and social space (the adjacent roofs of the nearly joined houses), doesn’t conform with basic assumptions we have about the fundamental layout of living space and community. And it raises a number of questions, many of which – about why people pioneered urbanization in this place, and how their town worked – have been examined by archaeologists such as Prof. Tuck. One question that interests me is whether “street” (as opposed to path) hadn’t yet been invented – rather analogous to the concept of “zero” in mathematics. People knew probably all too well what “nothing” was, or wasn’t, but it didn’t have any practical use once you had something that could be counted. Perhaps similarly, anyone could see that there could be a space between two houses, but maybe it didn’t occur to use that for anything other than another dwelling (which would have the advantage of keeping the continuity of roof spaces above, and eliminating the risk of people or things falling into the gap). So it does seem as if one could also suggest an “invention of the street” or perhaps “discovery of the alley” some time after Çatalhöyük. And by extension, that perhaps there might be concepts of urbanization that we, for all our sophistication, haven’t yet thought of (or maybe even contexts in which the ancient model from Çatalhöyük might turn out to be useful). Returning to Abe’s walking along the “narrow crack dividing house from house,” with benefit of Jackson’s discussions of space in Old World cities, there is another interpretation (which likely was obvious to other readers): the “narrow crack” was in fact a narrow street between rows of houses. But it still was more fun to imagine it the other way. 1. Japanese title: 赤い繭 (Akai Mayu), published 1950 or 1951. There have apparently been two translations into English, one by John Nathan in 1966, and the other by Lane Dunlap in 1987. Needless to say, Abe’s story line goes in an entirely different direction than what preoccupies me here. 2. Retrieved from Abe’s obituary in the New York Times (23 Jan. 1993). I did not find the story available online. 3. During the hot season, people would often sleep on their roofs – but when you wake up in the morning on your roof, you always ignore neighbors who are awakening on theirs (in general one never says “good morning” to someone before they’ve had a chance to at least wash their face and take care of their morning essentials anyway). Also one doesn’t peer over the edge of one’s roof into the adjacent courtyards. As such this was different rooftop environment than either Çatalhöyük or what I imagined from that line in Red Cocoon. 4. J.B. Jackson, “The Discovery of the Street,” in N. Glazer & M. Lilla, eds. The Public Face of Architecture: Civic Culture and Public Spaces, The Free Press, 1987. An article in The Atlantic about this essay by Charles R. Wolfe – “City Life: Revisiting J.B. Jackson’s ‘The Discovery of the Street’” – is a useful complement. After 8 months of regular and sometimes intensive bicycling in and around Vienna – even through the cold months of winter – my number came up: I was hit at about 7:30 a.m. on April 28 by a car making a right turn on a red light (legal in Virginia). The rest of the details aren’t necessary here except to say that the significant injury was a fracture to the tibial plateau on the leg that the car hit (fortunately no worse a break and now seems to be healed), and resort to legal means resulting in a settlement. I am very grateful to the doctors, my lawyer, and especially the two people who came forth after I had to advertise for witnesses. The incident was somewhat of a jolt, first for the accident itself and the injury, and then for the way the driver handled it. The fact two witnesses did come forth was extremely encouraging during what otherwise was a very difficult time. I am not sure about the percentage of bicyclists who have an accident with a car at some time during their life, but some old statistics on bicycle-related injuries (not only accidents with cars) estimate that 1 bicyclist in 20 is injured every year and that on the average, a bicyclist will have a minor injury every three years and a serious one every 15. And per mile of travel, cyclists are 4.5 times more likely to be injured than motor vehicle drivers. As far as car-bike accidents, a study in Toronto, Ontario showed that bicyclists caused only 10% of car-bike accidents (which apparently is much less than popular perceptions). And the bicyclist is always much the worse off for the encounter (same thing with motocyclists). Whatever the case, as a bicyclist it is worth going to a reasonable extreme to verify what a driver *might* do, and to try to make eye contact with them. The experience raises a question for me about how practical the slogan of “share the road” is. Driver error, or cyclist error (or road problem affecting cyclist speed or trajectory), and the cyclist loses – paying dispropotionaltely more than ther driver, no matter what compensation the latter may possibly receive. Well-demarcated bicycle lanes are a minimum for major roads. Maybe also there is a safety in numbers – more cyclists will get more attention and respect. I also used to bicycle in Chengdu, China and was grateful for bike lanes separated by curbs (even though these lanes have been narrowed in recent years to widen the main roads) and for the number of other cyclists around when crossing most major intersections. On the other hand, even in a city like Denver, Colorado – a community with a lot of cyclists, apparently good bicycle infrastructure, and awareness on the part of drivers – has noted that with more bicyclists, there is an increase in serious injuries from accidents with cars. The whole thing has also prompted some increased caution when I am behind the wheel. In any event, we have moved so I am no longer bicycling in Vienna, nor for the moment anywhere else. When the circumstances are right I hope to do so again. Oh – and I was wearing my helmet (funny how many folks asked about that). For various reasons, I’ve been doing a lot of bicycling over the last few months in Vienna. No, not that Vienna (dream on), rather the one in Virginia, not too far from Washington, D.C. This has me thinking about a number of things: transportation, energy, environment, sociology of bicycles, etc. In this season, bicyclists really stand out. But even in the warmer weather I did not note very many in Vienna. Judging by the car to bike ratio locally, the estimate that 1% of all trips in the US are by bicycle seems high. Whatever the numbers, there are some particular patterns to where one does and does not see bicycles in Vienna, and what kind of bicyclists. To begin with, I’m tempted to contrast two routes in Vienna. One of these is more affluent, running mainly along the Washington & Old Dominion trail (W&OD), serving mainly recreational and sports cyclists, and probably a few who use bicycles as part of their commute to work (though those would seem to be very healthy commutes judging by where W&OD approaches Metro stations in Dunn Loring and Falls Church to the east or office parks in Reston to the west). The two routes intersect in the center of Vienna town (on the town map these make an X with one thick red leg and one thin green leg). One sees more bicycle helmets and spandex on the W&OD – and more bicycles overall when the weather is good – than on Maple Ave. There are not a lot of bicycles off of these two routes from what I’ve seen, though some people bike to the Vienna Metro station which is a couple of miles to the south (the 54 bicycle rack spaces were full on the rare occasions I checked – don’t be impressed as there are 5800 car parking spaces there which fill up quickly each day). I generally take the Maple Avenue corridor, or some quieter sidestreets that roughly parallel it, and encounter only occasional adult or youth cyclists on Maple, and rarely children bicycling on the side streets. Bicycling in the US is not as common as it is in some other parts of the world, and indeed some of the infrastructure disfavors bicycling. The W&OD trail is a unique resource in this regard (some other urban areas in the US have similar trails on old rail right of ways), privileging Vienna and some neighboring communities. Apart from that there is not much – Virginia apparently ranks 45th among the 50 US states for funding of bicycle and pedestrian projects, so maybe I’m reporting on the low end of the spectrum in the US. It’s hard to tell what the attitudes are in this regard in Vienna, although it’s clear that not a lot of adults are biking – especially off the recreation-friendly W&OD trail. On the other hand I haven’t noticed that many kids on 2 wheels either. Also, from what I’ve experienced, Vienna drivers generally are quite courteous to bicyclists – certainly no behavior one could interpret as a negative judgment on the appropriateness of someone my age on a bicycle. And in one store, a younger cashier asked if I was biking for environmental reasons – for some it may even be a bit cool (although the weather lately has taken that all the way to downright cold!). On the individual level, one of the big reasons to bike rather than use the car is the savings in gas money. Fitness too is a benefit (why drive to a fitness club where you pay to use an exercycle?). Environment might be a motivation too, but it should be a factor on the macro level on which planners operate. Bicycling may not be appropriate for all people and in all situations, but more people traveling on bicycles instead of cars (at least for shorter errands) could have benefits both in terms of lower national consumption of fossil fuels, and improved public health. In all the talk in the new Obama administration of improved environmental policies and of increased expenditures for infrastructure, could bicycles and bicycling be given more attention as an area to develop? 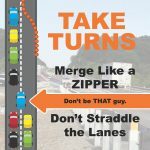 Hopefully the advocacy groups in this area like Bikes Belong , the League of American Bicyclists, and the Thunderhead Alliance will make this point. What about a goal to get the US closer to European or Chinese levels of bicycle use (though in China there has been a trend to more use of cars in recent years) – say moving from 1% to 5% of trips on bicycle rather than cars? Back again to the local level, what would it take to get Vienna, Virginia to use bicycles more?